With deep jungles interspersed with gorges and beautiful waterfalls, containing randomly dispersed antiquarian remains, the Hills of Kaimur retain their unique air of mystery. Forming the easternmost part of the Vindhya Range, beginning near Katangi in Jabalpur (Madhya Pradesh) and ending near Sasaram in Rohtas (Bihar), the Hills have sheltered human activities since the most ancient times, and one still finds several imprints of the activities of our early ancestors, with prehistoric rock shelters dating to even earlier than 10,000 B.C. 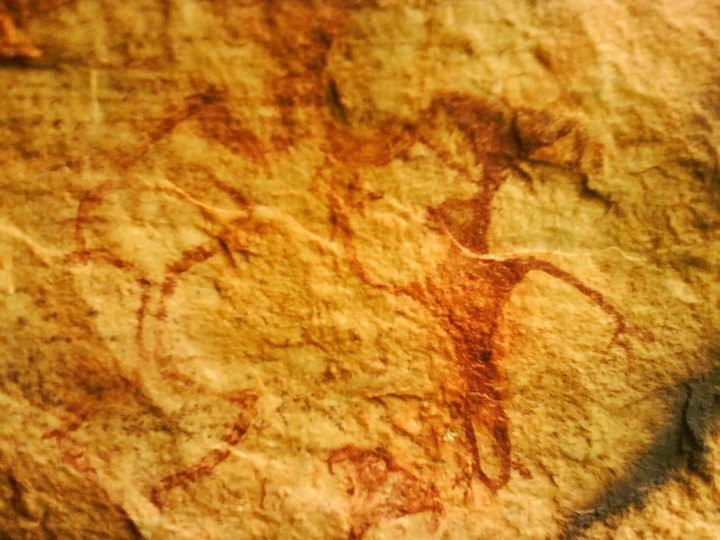 More than 500 pre-historic rock shelters have been found on the hills, and several of these have been found to contain paintings preserving the artistic impressions of our early ancestors. The Hills contain several early Hindu and Buddhist relics along with medieval ones. Several motifs like Baghauts which are memorials to persons killed by tigers and memorials of earlier Babas (holy men) met with at various locations on the hills have become a part of the popular culture. The importance of the Hills during the medieval history is revealed from the available documents of the period and discovered inscriptions. However, the importance of most of these historical sites is not fully understood even today, though it is well known and appreciated that the Hills have housed some of the earliest settlements of pre-historic men. Having earlier described the Forts of Rohtasgarh and Shergarh lying at strategic vantage points, along with the ancient temple of Mundeshwari, it would be in place to briefly discuss the other mysterious and general antiquities randomly found to be often dispersed on the Kaimur Hills. The Hills which are one of the oldest rock formations along with the Aravallis in the Indian sub-continent, mainly consist of old igneous rocks, which here are noticed in their magnificent forms and beautiful shapes, forming several deep gorges interspersed with several caves and waterpoints. Several beautiful waterfalls which attain their full glory during the monsoons are a visual treat. The water falls at Dhuan Kund and Telhara kund are often visited during the rainy season by local tourists for picknicking, but they represent only a fraction of the beauty and magnificence of several others which lie deep within the jungle and are seldom visited. 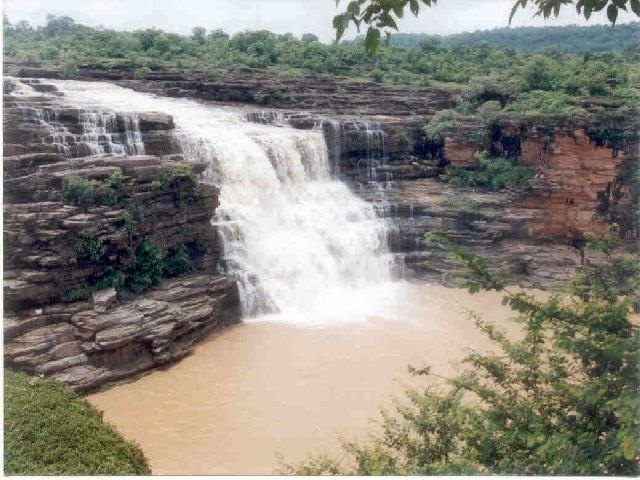 Some other important waterfalls noticed so far include the Karkatgarh Falls on River Karamnasa, Falls near Budhua and Dhansa villages (Rohtas), Amjhor Falls and Tutrahi or Tutla Bhavani Falls near Tilothu. A large area on and near the Hills is now notified as the Kaimur Wildlife Sanctuary, and still houses a wide biodiversity. The jungles of Kaimur had once served as an important home for the Tigers, now extinct here, with the last seen till the early 1980’s. Due to extremist activities which have subsided only recently, the hills have not been attracting regular tourists since a long time. But with the law and order now improved, nature lovers would be truly rewarded with a visit to any part of the Kaimur hills. Legendary tales, hiding stories of the still unknown history of Rohtas, inform that the Kaimur Hills had provided shelter to Prince Rohitaswa, who was the son of Survyavanshi King (Solar dynasty) Harishchandra, famous for his truthfulness in the Puranas. The name of the Rohtas district follows from the legend of Rohitaswa, who is believed to have married a local princess on the Kaimur Hills, and from whom several Kharwars trace their descent. The historical proof of these traditions is not found, but they have been mentioned as popular even during the visit of Buchanan (1813), implying their existence since long. 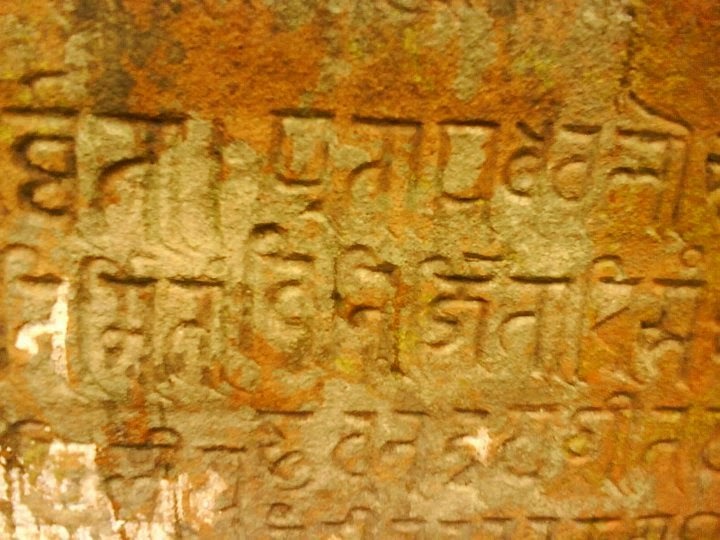 The earliest historical reference of activities on the Rohtas Fort dates from the rule of King (Mahasamant) Sasankadeva, the ruler of Karnasuvarna in the early 7th century, whose seal inscription was found in the Fort Premises, from an unidentified location on the rock face.Of the following period, some inscriptions of King Pratapdhaval of the Khayarwala dynasty are found at various places like Tutrahi (1158 A.D.), Tarachandi and Phulwaria Ghat (both 1169 A.D.). 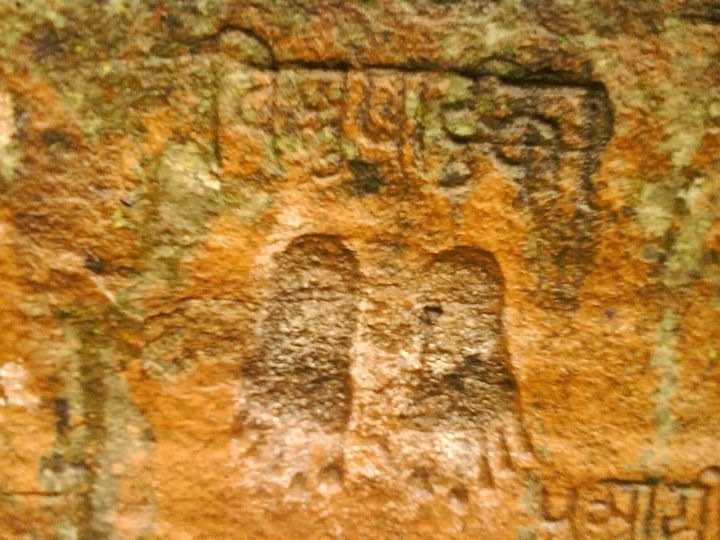 There are other inscriptions of the medieval times including one of a descendant of Pratapdhaval at the Lal Darwaza, Rohtas Fort dated 1223 A.D. and others dating to the rule of the Lodis and the Mughals, especially during the rule of Man Singh, as the Governor of Bengal, camping at Rohtas fort in the 16th century. The hills have been continuously inhabited by tribes like Kharwars, Oraons and Cheros, whose descendants still populate the various villages. The condition of most of these tribes which once formed the ruling classes of the famous Hill Forts is today described by extreme backwardness and poverty. Reconstructing the History of the tribes including Kharwars and Oraons is another interesting historical research task, in which much yet remains to be done. Along with Kharwars, the Oraons also inhabit the Kaimur Hills, and in their legends regard the Rohtasgarh Fort as their original residence and seat of rule. Oraon songs have made references to the battles fought by their tribesmen to secure the Rohtas fort from invaders. It is believed that the Oraons migrated from the Rohtas fort in large numbers to other parts of Jharkhand, after losing to the invaders. The fort was held by the Hindu rulers, till it was conquered by the Afghan ruler Sher Shah Suri in 1539 A.D. The name of the last Hindu ruler is not clear, but is mentioned as Chandra Ban by Buchanan. A proper and holistic survey of the Hills for the antiquarian remains that they possess is still wanting, and the Hills still retain an air of mystery with several unknown antiquities dispersed in the deep jungles. Thus, containing historical facets still unknown, the Hills provide a good chance of discovery to the interested traveler and researcher. 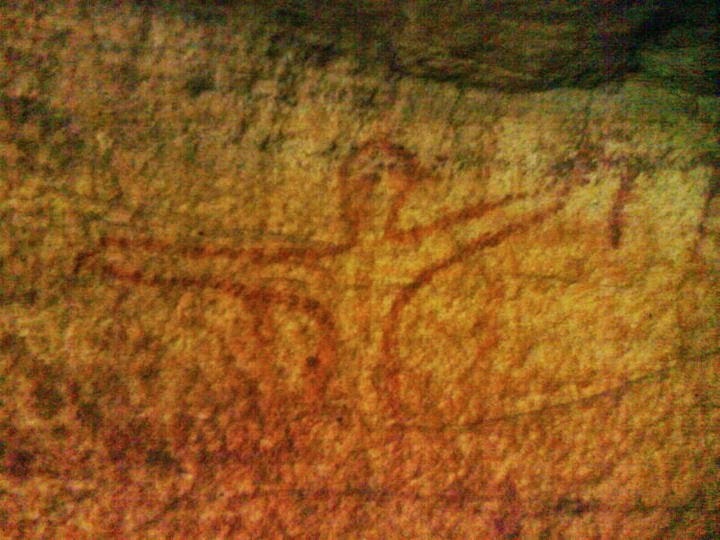 Even recently, some new rock-shelters containing early paintings have been discovered by Dr. Shyam Sundar Tiwary, a regular hill trekker and historian currently working with the Akashvani in Sasaram, who has also published several details of his finds in his books on the History of Rohtas. Buddhist Sites awaiting discovery ! During one of the visits, I chanced upon a fragmented Buddha statue which seemed to have emanated from a desecrated or destroyed temple at a site on the forest road near village Lohra under Adhaura Police Station in Kaimur. It was being worshipped as a van-devta by the tribals, who had placed figures of animals in front of it along with incense sticks. Surely, several other similar sites may also be found, and if studied they may open a new dimension about the history of the region, which houses one of the oldest inscriptions of Ashoka- the great dated 3rd century B.C. on Chandan Shahid Hill near Sasaram. The Chandan Shahid Hill seems to have been the seat of a Buddhist establishment in the ancient times. It appears to have been visited by Ashoka, the Mauryan Emperor in the 3rd century B.C., and the inscription was carved as a remembrance. The Hills lie along the path on which the Buddha had travelled to Sarnath near Varanasi after receiving enlightenment at Bodh Gaya. It is thus natural to expect traces of early Buddhist settlements in the vicinity. Several Buddhist remnants have also been discovered, but the holistic picture of the history is still wanting in details. Inscriptions yet to be discovered ! I was a regular visitor to various sites on the Hills during 2008-2010. Once, during a conversation with a learned Islamic scholar from Sasaram about its history, I was told about the existence of an inscription on rock face lying near the way from Tarachandi towards Dhuan Kund. The scholar was not sure about the contents of the inscription in unknown language, as he could not decipher it. Familiar about the Asokan Inscription on the Chandan-Shahid Hill nearby, I immediately gauged the prospect of discovering another ancient inscription, which may have been in the Brahmi script. Immediately, I set out for the place and tried to locate it at the site mentioned, but could not successfully locate it due to huge growth of thorny and leafy bushes in the vicinity. I proposed to search the same area for the inscription during the summer months and still hope, as I have been unable to re-visit the place. I feel that with some systematic efforts, the chances of discovering more inscriptions in unexplored locations on the Hills cannot be ruled out. Unknown Cave of Sultana Daku ? Similarly, I had also been informed about the existence of a cave ascribed as having been used by the gang of one Sultana Daku, who existed sometime in the 16th-17th century and supposedly found mention in a text called Tarikh-i-Sasaram, written in Persian, a copy of which I could not obtain during my endeavours. Sultana Daku was supposedly a gang leader, who robbed travelers on the grand trunk road in the medieval times, and had his hidden abode in a cave deep within the hilly recesses. How much of the stories can be believed is doubtful, but the cave was mentioned to exist amidst deep jungle on the path along the Kudra river leading to Dhuan Kund Falls from the main Grand Trunk Road. The cave is also reported to contain sculptures in its dark recesses. Going by the other similar discoveries in the area, like inscriptions with Mahishasur-mardini Durga image at Tutrahi Falls (Tutla Bhavani) and inscriptions at Tara-chandi Hills, among others, this very much seems to be a possibility. Moreover, there also exists a temple near Dhuan Kund, which was in existence during the visit of Buchanan in 1812-13, the history of which however, is unknown. Unfortunately, however, the way to the site described again passed through bushy and thorny jungles and is seldom visited. Keeping the difficulties in view, I planned my visit for the summer months, when the trees would shed their leaves thereby improving the overall visibility and search-ability. But the visit plan still eludes, as I have been engaged elsewhere. Hopefully, a systematic visit to the site would lead to some discovery of an unknown historical site. A Village where Gold rains ! I have a feeling that a thorough exploration of the Kaimur plateau would lead to very interesting discoveries, still unexplored. Another very interesting find was reported by the newspapers in 2013, from Senduwar village lying just below the Kaimur Hills in Rohtas district, about 7 kms southwest of Sasaram. Pieces of gold are reported to have been found flowing along with the rainwater descending from the hills. The origin of these gold pieces is unknown. Some excavations have been conducted at the village earlier, but have been discontinued possibly for some unknown administrative reasons and want of funds. However, the discoveries have indicated the presence of an ancient settlement at the village, the clear history of which remains to be dug out. The hills of Kaimur house several unknown mysteries, several of which have not been documented so far. The sites were given a miss by Cunningham, the father of Indian Archaeology. Generally speaking, several sites which were visited by Cunningham during his extensive survey of India, assumed importance for visitors and researchers in the times to come, while some sites with greater scope for discovery which did not attract the attention of Cunningham still struggle to find their place on the itinerary of tourists and researchers. The story of the Rohtas and Shergarh forts has been the same. While the Rohtas fort finds mention in the historical catalogues like the Ain-i-Akbari and the works of authors like Ferishta, the history of the Shergarh Fort seems to have not been mentioned anywhere. 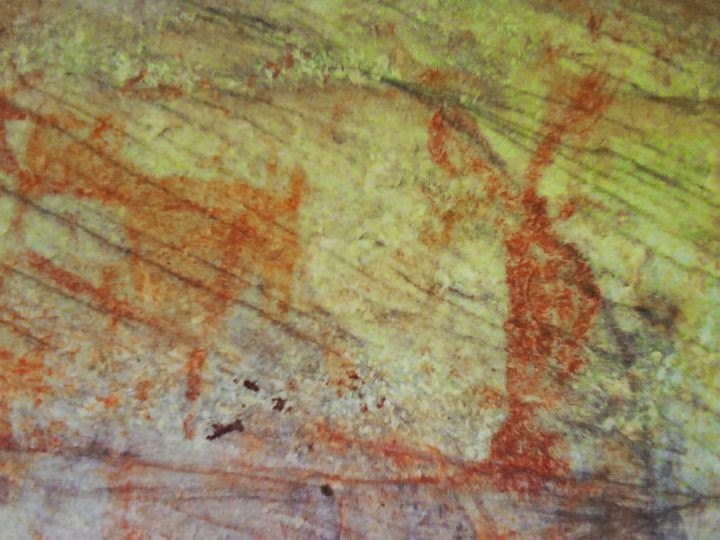 A chance visitor seldom visits the several pre-historic rock shelter paintings in the Kaimur Hills, and the famous forts lie neglected as ever. There is a need to properly survey the hills for their antiquarian remains and to popularize eco-tourism for the sustenance of the tourist circuit. That the tourist will always benefit from a visit, and never regret is for sure. Due to their innate potential both from the perspectives of historical remains that the hills possess, and the natural beauty encompassed, the Hills do seem to have a bright future, if properly preserved and made accessible. Expecting more research of the remaining ruins before it is destructed by invaders and antique thieves. For all those ways if we see how dearly all those things can be taken care of, 2 day new york to washington dc and philadelphia bus tours can be one of those activities which are growing on a maximum numbers of things..